Year 274 (CCLXXIV) was a common year starting on Thursday of the Julian calendar. Battle of Châlons: Emperor Aurelian reconquers the Gallic Empire. Rome calls Aurelian "Restorer of the World". 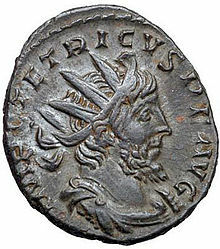 Aurelian makes an important change of Roman currency. December 25 – Aurelian has a temple dedicated to Sol Invictus. This religion becomes the state religion of Rome. The Kingdom of Aksum gets great wealth thanks to its control of Red Sea trade. December 30 – Pope Felix I dies in Rome after a 5-year reign. Japanese shipwrights build a 100-foot oar-powered vessel for Emperor Ōjin. The Japanese will not use sails for another 7 centuries.